When Boris Yeltsin died in April, I almost wrote about it. Instead, I figured I couldn't do a better job than Justin Raimondo and decided differently. But in the draft I had put together was a thesis that at the time seemed far-fetched: that the 1999 NATO attack on Yugoslavia was what a straw that broke the camel's back, and soured Russia on the rising American Empire. I now regret not publishing that, because it has just been corroborated - and by none other than the most famed Soviet dissident! When I returned to Russia in 1994, the Western world and its states were practically being worshipped. Admittedly, this was caused not so much by real knowledge or a conscious choice, but by the natural disgust with the Bolshevik regime and its anti-Western propaganda. 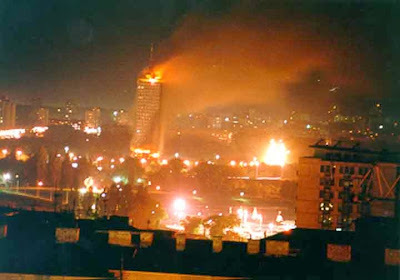 This mood started changing with the cruel NATO bombings of Serbia. It's fair to say that all layers of Russian society were deeply and indelibly shocked by those bombings. The situation then became worse when NATO started to spread its influence and draw the ex-Soviet republics into its structure. [...] So, the perception of the West as mostly a "knight of democracy" has been replaced with the disappointed belief that pragmatism, often cynical and selfish, lies at the core of Western policies. For many Russians it was a grave disillusion, a crushing of ideals. When Austria-Hungary threatened war with Serbia in 1914, Russia backed Belgrade. Not because it could handle a war at that point, or because such a course of action was in its best interest - arguably, neither was the case - but because in 1908 it had stood aside and allowed Vienna to annex Bosnia-Herzegovina in clear violation of the 1878 treaty that was supposed to create peace in the Balkans. Of course, the analogy only goes so far; even so, the Empire ought to realize that Moscow is really serious this time. As is Belgrade, custom-made polls notwithstanding. It is now clear that the 1999 war "lost Russia." Somehow, the worshipful embrace of Albanian peasants seems a bad bargain in comparison. Having witnessed the humiliating defeat of his proposal for an Albanian-dominated "Kosova" as a ward of the EU, former president of Finland and ICG board member Martti Ahtisaari told the Finnish Radio he would no longer be involved with Empire's land-grab from Serbia. He could contribute in an "advisory role," he told the media hopefully, but noted no one's asked him to do so. The battle for Kosovo is far from over. Albanian separatists are still determined to have their way, and their allies - the governments in London, Paris and Washington - are just as determined to paint their 1999 war of aggression as a triumph of democratic peace. Turns out Serbia and Russia are just as determined not to let them, even though the Empire has constantly underestimated both. Maybe that's why it lost the staring contest at the UN. For eight years now, I have been publishing commentaries about the Balkans on-line. In that course of time, I have received innumerable requests from readers for one written volume that would help them understand what took place in that corner of the world and why they should care (or not). Such a volume does not exist. However, something very close to it has just been published. On July 4th, most fittingly, online magazine American Thinker published Julia Gorin's superb dissertation on the "Balkans Quagmire" in the minds of Western observers. Rich in analysis, primary and secondary sources, unimpeachable logic and sincerity, this is one article anyone even remotely interested in the Balkans should read. Needs to read. If, some day, a collection of essays on the Balkans crisis of the past two decades is published, I hope that some of my works make it in there. But I know that this essay of Julia's will.